Aiseesoft VOB Converter for Mac is an excellent Mac VOB Converter software to convert VOB files on Mac to various video formats perfectly and quickly. The Mac VOB Converter also supports converting AVI to VOB, MPEG/MPG to VOB on Mac etc. With the powerful Mac VOB Converter, you can freely edit and adjust the output settings like video brightness, contrast, saturation, trim and crop videos, capture favorite images, insert watermark, etc. 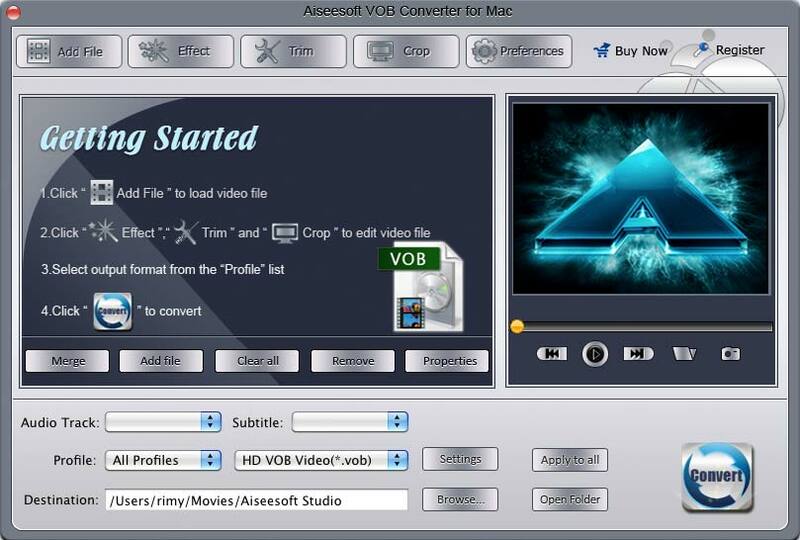 Aiseesoft VOB Converter for Mac is only suit for Mac users to convert VOB files or convert other video to VOB like AVI to VOB, MPEG/MPG to VOB on Mac. The input video formats include MPG, MPEG, MPEG 2, VOB, DAT, MP4, M4V, TS, RM, RMVB, WMV, ASF, MKV, AVI, 3GP, 3G2, FLV, SWF, MPV, MOD, TOD, QT, MOV, DV, DIF, MJPG, MJPEG. With the Mac VOB Converter, it is accessible to extract audio from video and convert other audio to MP3, M4A, WAV, AAC, AC3. You can preview the original video and the instant output video for your operation at the same time, and capture your favorite pictures while previewing. It can be saved in default folder automatically. Qweas is providing links to Aiseesoft VOB Converter for Mac 3.2.20 as a courtesy, and makes no representations regarding Aiseesoft VOB Converter for Mac or any other applications or any information related thereto. Any questions, complaints or claims regarding this application Aiseesoft VOB Converter for Mac 3.2.20 must be directed to the appropriate software vendor. You may click the publisher link of Aiseesoft VOB Converter for Mac on the top of this page to get more details about the vendor.